Trey Maust is Co-President and Chief Executive Officer of Lewis & Clark Bank, a bank he co-founded in 2006. 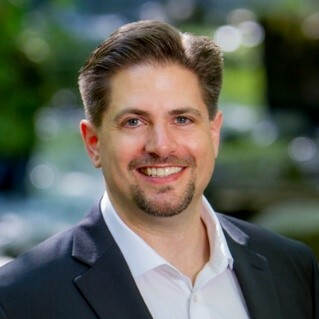 Maust began his career at Deloitte in Portland, where he conducted financial statement audits, internal control assessments, and FDICIA attestation engagements. He later transferred to Deloitte’s Merger & Acquisition Services Group in New York, where he was a resource nationally for bank acquisitions, conducting financial and operational due diligence on over forty transactions in a variety of industries for financial sponsors and strategic buyers. Prior to his current position, he served as chief financial officer at two Portland-area community banks. Maust is extensively involved in local and national advocacy efforts on behalf of community banks, and is currently the Chairman of ABA’s Community Bankers Council. He serves on multiple advisory and fiduciary boards of both for-profit and nonprofit organizations, including: Chairman of Synergy by Association, Inc.; advisory board member of the Conference of State Bank Supervisors; board member of Oregon Bankers Association; board member of Community Banks of Oregon; board member of Sheltered Harbor; advisory board member of StoneCastle Partners; advisory board member of Anvil Media; and past board member of Entrepreneurs’ Organization (Portland). Maust received a bachelor’s degree in business administration from Portland State University and is a licensed certified public accountant. In 2007, he was recognized as one of the “Forty under 40” by the Portland Business Journal.